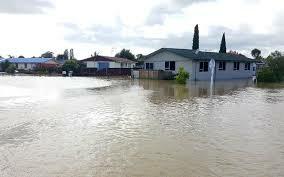 Flood waters can destroy the land, washing away roads, bridges, railway tracks and buildings. Crops can be ruined and livestock drowned. Lives are also at risk, particularly in flash floods. 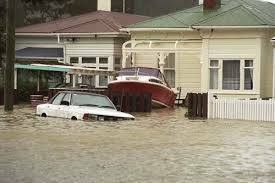 Floods are one of New Zealand’s most frequent emergency events. 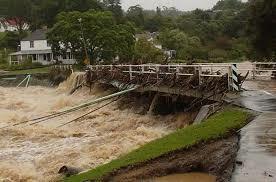 They happen when storms and heavy rain make rivers overflow their banks or drainage systems overflow into the streets. 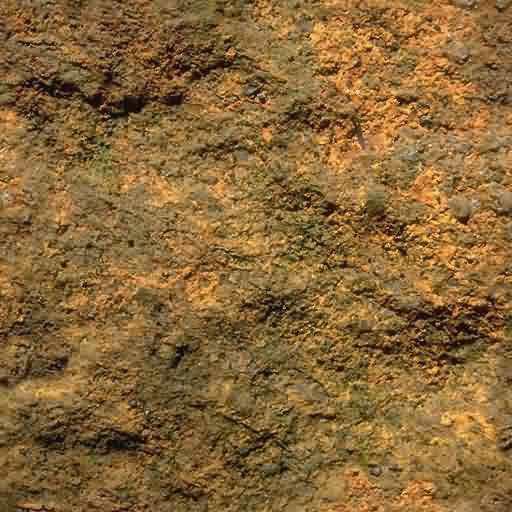 Normal rainfall soaks into the soil, is taken up by trees and plants, and runs off the land to form our streams and rivers. Floods happen when there is too much water and the run-off is too much to be carried by the rivers. 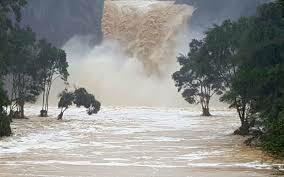 Rising rivers: During heavy rain rivers can overflow their banks into the floodplain. A floodplain is the flat section next to a river, and these can flood quite regularly. Flash floods happen when heavy rain falls in a small area with little warning. 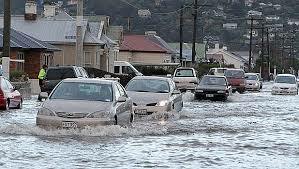 Coastal areas can sometimes flood because of unusually high tides or tsunami. Urban areas have a lot of concrete or hard surfaces which stop rainwater from soaking into the soil, so it is channelled into storm water drains. When the rain falls faster than the storm water system can manage, we get urban flash flooding. These floods usually happen very quickly and can block roads and damage buildings. Luckily, they usually don’t last very long. 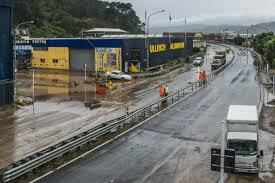 Flood waters can destroy the land and wash away or damage roads, bridges, railway tracks and buildings. 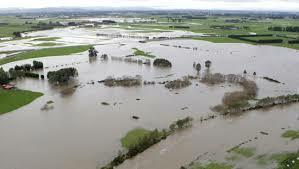 Crops can be flooded and livestock drowned. People have to take care and be prepared, particularly in flash floods where fast-flowing water filled with debris can sweep people away. The waters can even be strong enough to pick up vehicles. After a major flood there will be a lot of damage and pollution to clean up. It may take months or years to recover. Are you ready in case a flood occurs? 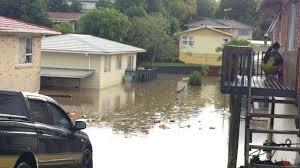 Find out about the worst flood in your area and how high the flood waters reached. Record this height and share it with your family – would it reach your home? Make a plan with your family to get through an emergency. Think about the things you need every day and work out what you would do if you didn't have them. Make your plan – print it out, stick it on the fridge and make sure everyone knows the plan. * Find out from your local council if your home or business is at risk from flooding. Ask about evacuation plans and local public alerting systems; how you can reduce the risk of future flooding to your home or business; and what to do with your pets and livestock if you have to evacuate. * Know where the closest high ground is and how to get there. * Develop a Household Emergency Plan. Assemble and maintain yourEmergency Survival Items for your home as well as a portable getaway kit. * Move animals and pets to safety. * Store chemicals in a high, safe place. If a flood occurs and these chemicals leak, they could be dangerous. * Keep valuables and some food and water above the high water mark. Attics or upstairs rooms are good places for storage, as long as there is easy access. * Check your insurance policy to ensure you have sufficient cover. * If you have a disability or need support, make contact with your support network. * Put your household emergency plan into action and check your getaway kit. Be prepared to evacuate quickly if it becomes necessary. * Where possible, move pets inside or to a safe place, and move stock to higher ground. * Consider using sandbags to keep water away from your home. * Lift valuable household items and chemicals as high above the floor as possible. * Fill bathtubs, sinks and storage containers with clean water in case water becomes contaminated. * Turn off utilities if told to do so by authorities as it can help prevent damage to your home or community. Unplug small appliances to avoid damage from power surges. 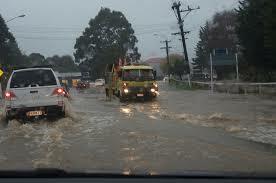 * Do not attempt to drive or walk through floodwaters unless it is absolutely essential. * It may not be safe to return home even when the floodwaters have receded. Continue to listen to your local radio station for civil defence instructions. * Throw away food including canned goods and water that has been contaminated by floodwater. * Avoid drinking or preparing food with tap water until you are certain it is not contaminated. If in doubt, check with your local council or public health authority.